Figure 4 Body temperatures as a function of ambient temperature during flight in three representative insects. Note that the temperature of the thorax (dark symbols) and, to a lesser extent, the head (light shading) are relatively independent of ambient temperature while that of the abdomen (open symbols) is not. Dashed line Tb = Ta. Drawn from data taken from May ML (1995) Simultaneous control of head and thoracic temperature by the green darner dragonfly Anax Junius (Odonata: Aeshnidae). 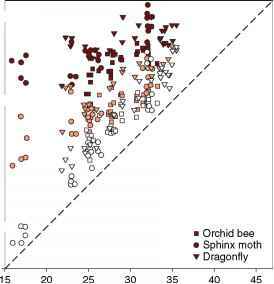 The Journal of Experimental Biology 198: 2373-2384; Borrell BJ and Medeiros MJ (2004) Thermal stability and muscle efficiency in hovering orchid bees (Apidae: Euglossini). Journal of Experimental Biology 207: 2925-2933; and Hegel JR and Casey TM (1982) Thermoregulation and control of head temperature in the sphinx moth, Manduca Sexta. Journal of Experimental Biology 101: 1-15. Figure 5 Dual controller model for the regulation of body temperature with a thermal set-point. One group of feedback elements (sensors) responds with increased activity to rising temperature while the other group responds with increased activity to falling temperature. By comparing the activity of both groups of sensors the load error is generated (the difference between set-point and Tb) and the control elements are activated in proportion to the load error. An increase in Tb results in dominance of warm sensor activity and the control elements (e.g., changes in behavior, heat transfer properties, or heat production) restore equilibrium by increasing heat loss. When the activity from warm and cold sensors equals each other the load error is zero and Tb is at its set-point. For Tb to be regulated the system requires Tb to be displaced from set-point. How far the system can be displaced from equilibrium establishes the load error that is tolerated for the system. Figure 6 Body temperature (red line) in relation to sources of heat input as a function of time in the varanid lizard, Rosenberg's goanna. In (a) under constant cool conditions (Ta = blue line) but the animal was free to shuttle in and out from underneath a radiant heat source (black bar) and in (b) under natural conditions that occur in summer and winter. When provided with an appropriate radiant source of heat from the sun Rosenberg's goanna can quickly elevate Tb above Ta in the shade, achieved through dark skin coloration and adjustments in peripheral circulation that favor heat gain. Once the desired (set-point) temperature is achieved the lizard can regulate Tb through behavioral adjustments that affect heat transfer. (a) From Clark TD, Butler PJ, and Frappell PB (2006) Factors influencing the prediction of metabolic rate in a reptile. 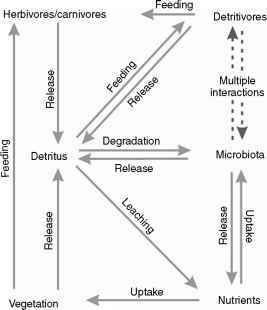 Functiona Ecology 20: 105-113. (b) Drawn from data obtained and modified from Christian KA and Weavers BW (1996) Thermoregulation of monitor lizards in Australia - An evaluation of methods in thermal biology. Ecologica Monographs 66: 139-157.
active group of reptiles, are able to behaviorally regulate their Tb between 30 and 36 °C on cold days when provided with an appropriate radiant source of heat (Figure 6). Some ectothermic homeotherms have a smaller range in Tb. For example, ectothermic fish are not usually considered homeothermic, but many species spend 75% of their time within ±2 ° C of their preferred temperature. It has also been demonstrated that ectothermic sharks possess thermoreceptors that are capable of temperature resolution to 0.001 °C and can occupy narrow thermal niches. Figure 7 Daily variation in body temperature in four mammalian species reveals a range of average Tb and variation about the mean. The acrophase (time of peak) for the nocturnal rat was much later than that for the diurnal species. Light and dark phases are indicated. 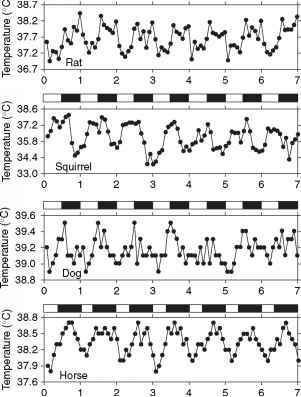 Reproduced from Refinetti R and Piccione G (2005) Intra- and inter-individual variability in the circadian rhythm of body temperature of rats, squirrels, dogs, and horses. Journal of Thermal Biology 30: 139-146.
set-point is lowered and some animals display a marked reduction in metabolic rate and an associated regulated decline in Tb (e.g., torpor, Figure 8). 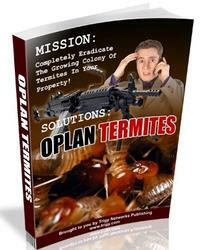 Finally, stressful situations such as infection result in an increase in thermal set-point (fever), whereas injury, hypoxia, starvation, and other situations can result in a decrease in the thermal set-point (anapyrexia).